I work at a large Metropolitan Police Dept, it was SuperBowl Sunday, February 7th, 2010 a young lady called the station, stated I have a 12 week old full blooded German Shepherd puppy with AKC papers, her name is Mia, she is so cute, I just got her from the breeder a week ago and paid $400.00 for plus all her stuff and I don't want any money for her but I can't keep her and I want to give her away today to a good home. I have 4 kids, the youngest one in diapers. I said to this young lady, you have 2 babies, yours and the puppy is a baby too. She stated, I thought I could do it but it too much work with the puppy. I'm a single mother. I ask her why did you get a puppy? 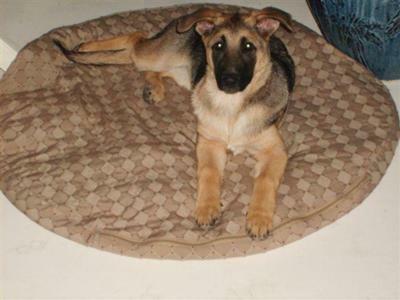 Because my children wanted a dog, my aunt had a German Shepherd and she was a great dog so I thought that is what I'll get a female German Shepherd puppy. I ask why did you called the police dept, her response, because the police dept have German Shepherds. Mia is so smart I was hoping the police dept would take her, she would make a good "police dog". I'm sorry it doesn't work that way here, the male dogs come from Europe and they are 2 yrs old. I looked at my computer and realized I just typed Ebony's name in my folder when I got this call. I told the lady, our beloved Lab, Ebony, went to heaven 2 weeks ago, she was 12 1/2 yrs old and she had a wonderful life,to us she was our child, my husband and I don't want another, we miss her. The lady stated she was sorry for our lost. I can send her picture to you, she is so cute. What are you doing now, it's 11:30am,(for some strange reason I wanted to see this little German Shepherd puppy, I started to feel this must be a sign from God and who knows maybe Ebony has something to do with this too) she reply I can be at the station in 20 minutes, just ask for me, Linda. I told my coworkers what just happen and we were excited to see this little puppy. A little while later, I hear, is Linda here. I called for my coworkers and we saw this beautiful little Mia with huge paws, beautiful markings, wagging her tail and running around in the lobby. The lady stated she pick her because she had huge paws, she'll be big and can protect my kids. Without realizing it,I said Mia come to mommy. Mia needed a home and we can give her that plus a wonderful life with love. My husband came to the station and he was surprise but we took her home. She just turned 1 yr old. Mia in a Italian means mine and she is ours to keep. She is healthy and happy, we love her and she loves us too! I can see she's very attentive and obtw I love her coat! Thanks for your post about my pup Astro btw. Heart warming story and glad Mia is in good hands. That was fate!! You were meant for Mia. She is wonderful. I will update and post pics of Acer! What a great story. She is sooo cute! Congradulations.